Colour ~ Honey rich, pale amber a strong colour. Outside in daylight colour is paler. Texture ~ A light oily band of gold with tiny beads around the rim touching the glass. Coats the glass, but not heavy enough to fall straight away.Later the legsfall down the glasslike an intricate lace border. Nose ~ Toastey, warm, echoey, sun onbig rounded stones, very open aroma, not a closed in scent. Then a wiff of thistles, like having a cloak thrown back over ones head, cloaked in something light but momentarily encompassing. Underneath a woodenframe of oak creatingan open structure to holdan old fashionedbee skep allowing a honey smell and a sweetness of icecream. This is not a mined dram, this is a dram sitting on the surface of the earth, in a warm place with the sun pouring down on you.There will be a steep but curved bank behind one showing rock face and grass, and a flat open aspect with grasses and sun bleached vegetation ahead of one. One is encompassed in a sunny flat valley. Taste ~ honied custard, with vanilla, then a hint of walking through bracken. Thereare light happy notes here now, likechildren singing on the top. A taste of raisins and a slight tarriness. There is a complex nest of flavours on the middle of the tongue. There is a delicious bee stung feeling on the lips. A slightly older feel now, colours are dark brown, a fleeting image of the wood of old dark casks in a warehouse. A hint of summer raspberries, then after a time a flatness, a harshness. Mouthfeel ~ so smooth, a coating of silk in the mouth, a silken shawl. 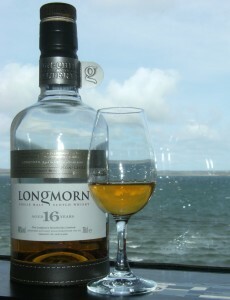 This dram is you sitting in the sun at the curve of the valley head. You aretherewith the stones and the sun and the bees, and the boat isin your mind, but you are content where you are. You don’t walk further. The journey of the dram is short. It is an exploration of what is around you, where you are. One experiences the main structure of the dram in the centre of the tongue. Look of the bottle ~ Leather strap around the base of the bottle, Metal tag on neck of bottle. Colours are pale deep green, white and gold. The glass of the bottle is very thick. It has a dimple on the bottom of the bottle. It looks excellent. This is a very carefully designed bottle. The metal tag adds the balance of YIN energy which stops the bottle being too masculine and heavy. This is very designed. It is designed for people, who don’t want to be seen as old fashioned, but associate masculinity with the old whisky image. The metal tag is very Next. DRAM ARCHITECTURE ~ This is a SENSATION dram appearing as a THINKING dram. Distillery ~ Longmorn is in Elgin in Moray. It is a Speyside distillery. It ispart of the Chivas and Glen Livet Group which are in turn owned by Pernod-Ricard. Longmorn was founded around 1894.